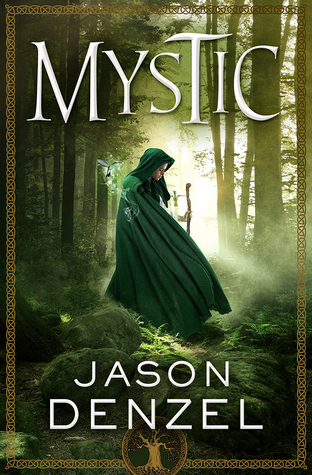 Mystic is a great book, and there were so many elements of it that I enjoyed. First off, the world of Moth was captivating, and filled to the brim with whimsical creatures, incredible places, and relatable characters. I already can't wait for the sequel, because there is so much more I want to know. From Fayun—the land of the Fae—to the bonds magical creatures form with humans, Jason Denzel left so much room for imagination and wonder. While I can't say that this book was the most original one I've read, the stupendous writing made up for this, and I'm thrilled I got to read it. There were a lot of plot twists in the story, and I wish I could say that I found all of them to be shocking, but I did see some of them coming. However, the need to know what would happen kept me turning the pages like a madwoman until the very end. My main issue with the entire story was how underdeveloped the Black Claws (a.k.a. the main group of villains) were, even though I truly wanted to know more about them! Their descriptions, motives, and backstories felt glossed over, which made the rest of the book confusing at times—especially since they were so important to the plot line. Overall, I loved Mystic. The writing was fantastical, the descriptions were whimsical, and I can confidently say that it would be a fun read for any fantasy lover. 1) I am fascinated by the land of Moth, and am excited to learn more about it in the sequel! It is filled with silver animals, beautiful flowers, and magic galore—which sounds like the perfect world to me. 2) Mystic had an immaculate balance of information about its magic to leave me satisfied, yet curious to find out more without feeling overwhelmed. There is a lot of room for expansion, like explanations about the land of the Fae creatures, and their bonds with humans—but I definitely feel that this book managed to avoid info dumping. 3) This book was so fast-paced, and something was always happening to keep me turning the pages. I read this book almost without stopping, and it was a quick and exciting read. 4) The songs in this book were spectacular, and I loved imagining the different tunes and melodies they would go along to. 1) The group of people fighting against Pomella and the High Mystic were glossed over, although they were a major part of the plot. Every part of their characters seemed skimmed through, and this underdevelopment made me enjoy the book less. 2) Mystic was predictable for me, sometimes even during plot twists that should have been shocking. I could mostly see them coming from a while away, which lessened my enjoyment of the story. 3) Certain aspects were kind of cliché. For example—three trials, a magic competition, and a common girl who suddenly discovers she's special. "Your dress! Look at it! Those ocean waves are so beautiful." "They're ivy," Pomella said, frowning. She ran to Vlenar and would have hugged him, except he gave her a hard look that reminded her they were still in danger. That, and Vlenar didn't seem like the hugging type. I like that this book has a fantastic world built by the author, but a predictable fantasy story is a problem for me. Thanks for the review--I love the summary you always have with strengths/weaknesses! I am happy to know that Mystic is the start of a captivating new epic fantasy series from the founder of Dragonmount. And my students are eager to read such kind of books who are newly graduates and taking executive CV writing help from the best CV writers at CV Folks as Jason Denzel’s new book is a enchanted coming-of-age story that yet has the kind of crossover demand which would make it a hit with a wide range of booklovers.